The plans of Governor , Owelle Rochas Okorocha to continue to distribute school free to schools in Imo State has now been abused by Head Teachers and Principals who now extort money from pupils and students. Information revealed that good number of schools in Owerri zone are alleged to been involved in the sale of the school bags while Governor Rochas Okorocha said it must be free. Amakohia secondary school has been alleged to be one of the schools that refused to give the government bags free to students as we gathered from a reliable source. The source disclosed that the teachers claimed to collect Parents Teacher Association (PTA) money and that of Inter House Sports which most students refused to pay. The defense of the teachers and school authority was declared unacceptable by Ministry of Education. 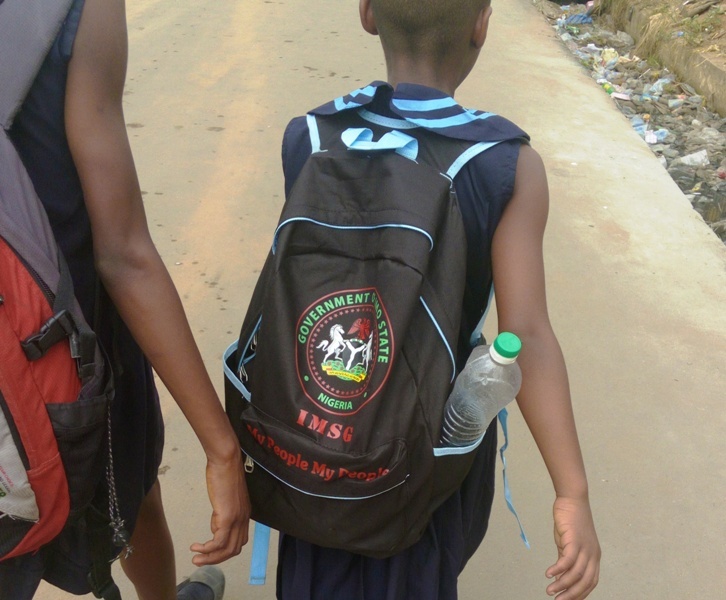 More schools in Owerri zone are said to be extorting money from pupils and school children without getting clearance from the government, but it was also alleged that some Agents working with Ministry of Education made it possible for the Bag racketeering to continue in schools. This development has put Imo government in bad light. The Governor few days ago at Hero’s square new Owerri flagged off the distribution of the bags to school children. 12 schools in Owerri zone were used to test run the programe but surprisingly some of the schools are yet to collect their own bags. Right at the Hero’s Square, school children demanded that the bags should be shared on the spot. Governor Okorocha supported the school children but at the end of the flag off ceremony at Hero’s square, no bag was shared. Councilors were asked to take the bags to their communities and thereafter the bags were given to head teachers and principals. The State Government is seriously investigating the matter as parents raised alarm on the issue. From all indications those selling the bags are causing problem to the Rescue Mission government. The opposition group has already capitalized on this alleged sale of school bags to paint the Rescue Mission black. Imo Government as we learnt has moved to sack any teacher found guilty of selling the government school bags.